"Shortall" redirects here. For the name, see Shortall (name). Bib-and-brace overalls (AE), overalls (AE), or dungarees (BE) is a type of garment which is usually used as protective clothing when working. The garment is also referred to as a "pair of overalls" by analogy with "pair of trousers". Overalls were originally made of denim, but they can also be made of corduroy or chino cloth. Overalls were invented in the 1890s by Levi Strauss and Jacob Davis at Levi Strauss & Co., but they went through an evolution to reach their modern form. Initially only used for protective clothing in work settings, they have become a garment of high fashion as "potential cult items". The exact beginnings of the wearing of overalls are unclear, but they are mentioned in literature as early as 1776 as a protective working garment commonly worn by slaves. The first evidence of overalls being mass-produced are those made by Levi Strauss and Jacob Davis in the 1890s. The first "jeans" they invented were actually overalls ("waist overalls" or "waist-high overalls"), consisting of suspenders attached to denim pants with buttons. There was no top part with a bib. From the beginning, denim overalls were popular workers' garments due to their durability. In fact, Levi, Strauss & Co.'s slogan in the 1880s-1890s was "Never Rip, Never Tear." In 1911, Harry David Lee made the first bib overalls, made of pants with pockets with a bib and straps over the shoulders. In 1927, Lee's developed a "hookless fastener" and created "buttonless" overalls. Zippers replaced buttons. Soon after, Suspender buttons were traded in for belt loops to attach over-the-shoulder straps. In the 1930s, the poorest segments of the American population wore overalls: farmers, miners, loggers, and railroad workers. They were most commonly worn by men and boys in the Southern United States and the Midwestern United States. They can be seen in many of Walker Evans's photographs. Bib overalls (in different colors and textiles) have become a popular garment among American youth, from the 1960s onward. 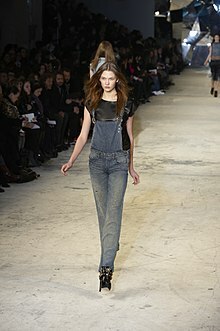 In the 21st century, overalls have evolved into a high fashion garment. Designers such as Stella McCartney feature them in ready-to-wear collections for women and children. Stella McCartney's children's overalls sell for as much as $138. Nordstrom sells overalls for as much as $1,080. Lee's and Levi, Strauss & Co. were not the only companies making overalls in the late 19th and 20th centuries. One of the oldest brands of overalls, OshKosh B'gosh, founded in 1895 in Wisconsin, specialized in hickory stripe (blue and white stripe) bib overalls. The company produced bib overalls for children in the late 1960s. Larned, Carter & Co., a company from Detroit, called themselves the "World's Greatest Overall Makers." They marketed their products as uniforms for railroad workers. One of the biggest overall manufacturers was Blue Bell, which began in North Carolina in 1904. It was popular among railroad workers. Jellico Clothing Manufacturing Co., later renamed Big Ben, was a major competitor of Blue Bell. Big Ben bought Blue Bell in 1926 and continued under the name Blue Bell. Blue Bell then bought the overalls company Casey Jones. Shortalls (a contraction of the words "short" and "overalls") are overalls adapted so the part of the garment below the waist is shorts. They can be worn by toddlers, with "crotch and leg snaps to facilitate diaper changes." In skirtalls, the part of the garment below the waist is a skirt. In capri overalls, the legs are capri pants. Salopettes is the French word for bib-and-brace overalls. The word is used in English for a similar garment to overalls worn for sailing, skiing, diving and other heavy duty activities. They are made of wind-and-waterproof trousers, traditionally with a high waist reaching to the chest and held up by adjustable shoulder braces. Historically, military "overalls" were loose garments worn in the 18th and early 19th centuries over soldiers' breeches and gaiters when on active service or in barracks. After 1823, the term was replaced by that of "trousers" in British Army documents, but it survives to the present day in reference to the tight-fitting garments strapped under the instep, worn as part of the mess dress and full dress uniforms of cavalry regiments. ^ "Walton & Taylor "The History of Overalls (Jeans)"". www.waltontaylor.com. ^ a b c d e 1973-, Kyi, Tanya Lloyd, (2011). The lowdown on denim. Hanmer, Clayton, 1978-. Toronto: Annick Press. ISBN 9781554514151. OCLC 825770364. ^ "Christian Dior Fall 2017 Ready-to-Wear Collection - Vogue"". www.vogue.com. ^ a b c d e 7-, Sullivan, James, 1965 November (2006). Jeans : a cultural history of an American icon. New York: Gotham Books. ISBN 1592402143. OCLC 62697070. ^ a b Museum,, Fashion Institute of Technology (New York, N.Y.). Denim : fashion's frontier. McClendon, Emma,. New Haven. ISBN 9780300219142. OCLC 930798077. ^ a b Douglas., Gunn, (2012). Vintage menswear : a collection from the Vintage Showroom. Sims, Josh., Luckett, Roy., Vintage Showroom. London: Laurence King. ISBN 1780672039. OCLC 866622270. ^ a b c d "Overalls - Definition of an Overall from the Clothing Definitions Directory by Apparel Search". Retrieved November 25, 2017. ^ "Stella McCartney - Designer RTW, Bags & accessories, Lingerie, Adidas by Stella McCartney, Fragrances, Kids". Stella McCartney - Designer RTW, Bags & accessories, Lingerie, Adidas by Stella McCartney, Fragrances, Kids. Retrieved November 13, 2017. ^ "Tu es mon TRÉSOR Imitation Pearl Embellished Overalls (Nordstrom Exclusive) | Nordstrom". Nordstrom. Retrieved November 13, 2017. ^ Bryant, Margaret M. (1974). "Blends Are Increasing". American Speech. 49 (3/4): 163–184. doi:10.2307/3087796. JSTOR 3087796. ^ "the definition of salopettes". Dictionary.com. Retrieved November 25, 2017. ^ "Une histoire de salopette". La Parisienne (in French). May 24, 2010. Retrieved March 27, 2018. ^ Carman, W.Y. A Dictionary of Military Uniform. p. 97. ISBN 0-684-15130-8. Look up overall or shortalls in Wiktionary, the free dictionary.